For nearly three decades our Utah Printing Company has been providing our customers with the Best Quality, Service, and Pricing. Our Printing Company in Utah is staffed with a professional and dedicated staff who will always take the time to understand your companies needs. "Your project is as important to us as it is to you". Developing an outstanding and understanding relationship with our customers, ensures that your job is done on time, correctly, and at the best possible price. We will always take the time to walk you through your project from a "Printers Perspective" so that your finished project is as you envision it. We provide Business Printing (Brochures, Flyers, Letterhead, Envelopes, Business Cards, Checks, etc.) Promotional Printing (Pens, Mugs, Calendars, etc.) Screen Printing, Embroidery, Signs and Banners, as well as Design, Fulfillment and Direct Mail Services. Our philosophy as a UT Printing Company is simply to be the best by providing the best in customer service, competitive pricing, and quality printed materials with our Utah Printing Services. Our customers can rest assured that once a project is quoted our price will include all steps needed from pick-up to delivery with our UT Printing Services. Word of mouth advertising is said to be the best form of advertisement, and the word on us is "SATISFACTION!!" 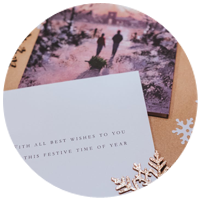 Click on the link below to create and order your own customized holiday cards. All of our cards can be personalized with your company or family name. Browse through over 260 cards or choose from one of our card categories, and then pick the verse of your choice. Selecting your Holiday Cards has never been so easy. Please contact us for available products, materials and pricing.